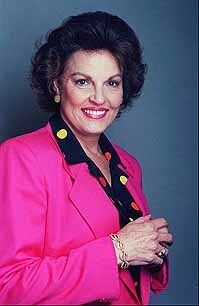 Anita Bryant is a formerly semi-popular musician who is probably more famous for her stances against homosexuality in the 1970s, including her fight to repeal a Florida ordinance that disallowed discrimination based on sexual orientation (successful, though Florida turned around 20 years later). To achieve her goals she founded the coalition Save Our Children, a fundie organization supported by Jerry Falwell, where she primarily argued that homosexuality is a sin and that the primary goal of gays were to recruit and molest children (”[A]s a mother, I know that homosexuals cannot biologically reproduce children; therefore, they must recruit our children”), as well as slippery slopes like ”if gays are granted rights, next we'll have to give rights to prostitutes and to people who sleep with St. Bernards and to nail biters” (no idea what she’s getting at). Since Bryant was spokesperson for Florida orange use, her actions led to a rather famous boycott campaign against said product. More here. Bryant continued touring the country to initiate various rabid anti-gay ordinances with various levels of success, including trying to get the Briggs initiative passed in California: the initiative would have made pro- or neutral statements regarding homosexuals or homosexuality by any public school employee cause for dismissal. Her ministry’s’website says she still defends her old position. Sally Kern is a fan, and the fandom seems to be mutual. Bryant used to be married to Bob Green, but divorced him in 1980. Unfortunately, Green is a fundamentalist who doesn’t recognize civil divorce and still considers Bryant his wife. Diagnosis: A remarkably successful activist against freedom, liberty, and humanity – with campaigns based on a remarkable level of detachment from reality – she seems to be relatively neutralized by now. Her name is still revered in certain bigot circles, however. Her only fault was that she cared enough to do something about it. Why would you fault her for this. She is not a bigot but expressly proclaimed that God could forgive the sin of homosexuality to those who desired forgiveness, cleansing and another way to do life. She was only trying to protect her chldren's freedoms as well. There is nothing looney about this! Doctor, we have one more loon here by the name of Wayne Avis!!! I here he works on Sunday, so lets stone him to death!!! I also here that he eats pork, shellfish and wears garments composed of two different treads! ALL SINS!!! !